One day in the year 1408 the great apostle Saint Vincent Ferrer suddenly interrupted his sermon, to declare that there was among his hearers a young Franciscan who would be one day a greater preacher than himself, and who would be placed in honor by the Church before himself. This unknown friar, who would be canonized only six years after his death, was Bernardine, then 28 years old. Of noble birth, he had spent his youth in works of mercy, caring for the sick before he entered religion at the age of 24. Owing to a speech defect, Bernardine's success as a preacher at first seemed doubtful, but by the prayers of Our Lady, this obstacle was miraculously removed in 1417, and the Franciscan friar began an apostolate which lasted until he died. One day, preaching in praise of the Blessed Virgin, he applied to Her the verse of the Apocalypse: A great sign appeared in heaven, a Woman clothed with the sun... At once a brilliant star appeared over his head. He was understood, when he spoke in Italian, by listeners of the Greek language who knew only their maternal tongue. He obtained miraculous conversions and reformed the greater part of Italy by his burning words and by the power of the Holy Name of Jesus. He preached that devotion, displaying at the end of his sermons, the Holy Name written on a tablet. He was also a zealous apostle of the cult of Saint Joseph. It is said that during sixteen years, and some say eighteen, he did not pass a single day without preaching. But his success had to be purified by the cross. The Saint was denounced as a heretic, and his devotion as idolatrous. After many trials he lived to see his innocence proved. In 1427 he refused the bishopric of Siena, and a few years later two others, in order to continue his preaching. He miraculously cured lepers and other sick persons, and raised to life several deceased persons. The Feast of the Holy Name of Jesus, established in 1530, was extended to the entire Church in 1721 by Pope Innocent XIII. 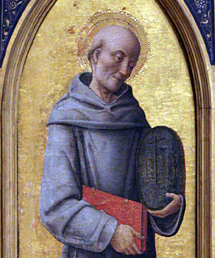 Saint Bernardine was appointed Vicar General of his Order in 1438, which office he held for five years, then preached again for a time until his last illness forced his retreat in 1444. He died on Ascension Eve of that year, while his brethren were chanting the antiphon, Father, I have manifested Thy Name to men. Already in 1450, a Jubilee year, he was canonized. Reflection. Let us learn from the life of Saint Bernardine the power of the Holy Name in life and death.